Social Media Prism: Are We Over-Sharing Content? We don’t need Zuckerberg’s Law of Social Sharing to figure out that we’re sharing a lot more than before. If you take a look at the last 10 tweets in your Twitter stream, chances are, on an average, at least 6-8 of those contain a link. A 100 million links are shortened daily, on an average, using the bitly service alone. Though this depends on how many people you follow on Twitter, friend on Facebook or circle on Google Plus, we are probably being exposed to hundreds of links daily. Even if you do nothing else but hang out over various social networks, it would still probably be impossible to read every link shared (not that anyone would even want to do that) since there is only that much content that you can consume in a day. 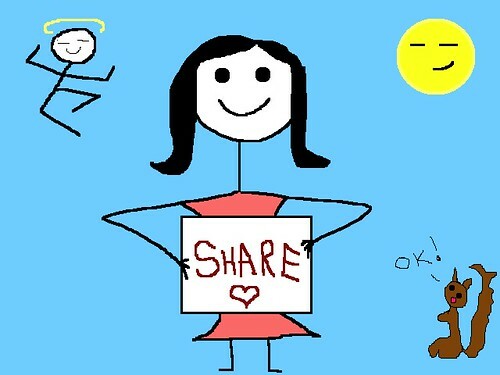 Which leads me to the question I’ve been thinking about lately – Are we all over-sharing content? And are we adding value if we are sharing lots of links that are getting either very few or no clicks? But I don’t think that you can delve into either of these questions without first asking why it is that we share in the first place since that's what essentially drives our sharing behavior. In a way, what we share defines us as people – it signals to others what we are reading, what we are interested in and what issues or topics we really care about, helping us connect with others who share similar interests. We also share to make ourselves feel more involved, by providing others with valuable or useful information that informs, shapes or changes opinion or drives action. Much of this was validated by a study conducted a few months ago by The New York Times and Customer Insight Group on the psychology of sharing content online. Though there have been studies on the science of optimal tweeting, it can still be tough to predict what will and will not get attention, especially on Twitter, since it’s such a fleeting medium. Whether a link gets clicked on Twitter can depend on a range of factors from how compelling the link sounds, how many people are following you, how much ‘influence’ you wield among your followers (how do we spell Klout again? ) and how much attention they are paying to their stream at a given point in time. But in the end, each of us is competing for attention – every tweet we send out competes for a click or a read in Twitter’s ever-flowing stream. In a conversation over Twitter, someone I follow commented that she sometimes shared links as a way for her to bookmark items of interest – more proof that people don’t always share content with a purely altruistic intent. But I do see more and more people complaining of information overload and the need to take social media sabbaticals – most people can’t seem to keep up with their Google Readers and all the other barrage of content being shared daily. All this does make me wonder if we all need to be more eco-friendly citizens of the Twitterverse by doing our part in cutting down on the social media noise that we are inadvertently contributing to. 1) Share less, engage more – Just sharing content can be boring and sometimes, the discussions around interesting content can be worth so much more than simply tweeting or posting links. 2) Avoiding sharing too much content at the same time - Apps like Buffer are great tools for spacing out tweets containing links. Rarity has value and personally, I am more likely to pay attention to someone who tweets links a few times a day (10 or less) versus a dozen links shared every hour. 3) Greater focus on quality - Share more meaningful (something that offers original, unique or new perspectives) content versus sharing most of what I read. What motivates you to share content on social networks? How do you define and adapt your own content sharing strategies? Share your thoughts below. I like the idea of sharing items that might not be entirely relevant to the majority of followers, for example a great post on science. The reason I find this worth doing is it connects me with people I might not ordinarily meet. In addition, I think it's good to expose oneself, and perhaps our friends, with ideas beyond what we might normally encounter. I agree with your line of thinking. A majority of people who follow me are PR/communications people in the U.S. and most of us end up following the same people more or less (Twitter even shows you people 'similar to you,' which only adds to it.) Some people do have a very focused content-sharing strategy and will only share PR, social media or communication-related information but I personally find that very boring. We are all much more than just a content-sharing RSS feed. Quite often, I find that a personal musing will invite a lot of discussion and comments on Twitter and can be a great way to engage with other people. I agree with your line of thinking. A majority of people who follow me are PR/communications people in the U.S. and most of us end up following the same people more or less (Twitter even shows you people 'similar to you,' which only adds to it.) Some people do have a very focused content-sharing strategy and will only share PR, social media or communication-related information but I personally find that very boring. We are all much more than just a content-sharing RSS feed. Quite often, I find that a personal musing will invite a lot of discussion and comments on Twitter and can be a great way to engage with other people.